Reviews » DVD Video Reviews » The Kinetophone: A Fact! A Reality! If you ask most casual film fans when sound came to the movies, they'd say in 1927 with the release of The Jazz Singer. While that is when they became popular, various companies were looking to add sound to movies for years. 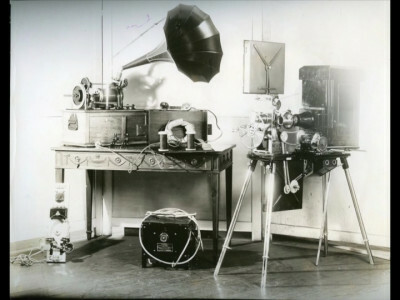 The earliest films that were created with synchronized sound for public consumption were released way back in 1913 under the Kinetophone label. It was a sound-on-cylinder system created by the Thomas Edison's company, and one of the reasons that it didn't catch on in popularity was that it didn't really work. The sound and visuals would often go out of synch and once that happened it was hard to get them back together. Now, thanks to modern technology, the Library of Congress in association with the museum of the Thomas Edison National Historic Park has been able to match up the audio and video to the eight surviving Kinetophone movies where both the film and the audio cylinders still survive. These have made their way to DVD courtesy of Undercrank Productions on the disc The Kinetophone: A Fact! A Reality! Not only does the disc have all eight Kinetophone films, but there are a couple of nice extras too. 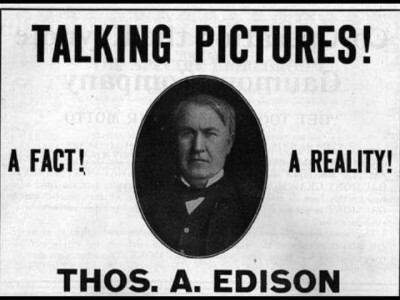 When Edison began working on his moving picture project, he was actually intending to invent an audiovisual system. In a filing with the US patent office, he described a system that would allow viewers to "see & hear a whole opera as perfectly as if actually present." Though his first films, released in 1893 and shown in a one-person viewer called a Kinetoscope, did not have sound within a couple of years he had added a cylinder phonograph to the Kinetoscope cabinets. These only played music that was not synchronized to the film, but it was a start. Leap forward to 1913 and the Wizard of Menlo Park released his next great invention: the Kinetophone. This was a projected film synched, by a complex series of pulleys and cords, to a cylinder phonograph. The actors in these productions were filmed and recorded at the same time so all a projectionist had to do was start both at the same point and you'd have synchronized sound. Well in theory at least. In practice the system did not work very well at all. Since this was well before electronic amplification, the horn from the phonograph needed to be near the audience, and that wasn't always were the projector was set up. That necessitated having two operators who had to coordinate their efforts, which isn't as easy as it may sound. If the film broke and had to be spliced back together with a frame or two removed (something that was not uncommon) then the film would be out of synch from that point on. As cords stretch and slip the two machines would again become misaligned. While it was a good idea, it just didn't work in practice and the system was abandoned in 1914. It has been reported that there were over 200 Kinetophone movies made, only eight survive today along with their audio cylinders. All eight are presented here, and they're very interesting to watch. They present a wide range of movie genres (though there is a musical number in just about all of them) and show how much Edison was trying to give the people a variety of subjects to view. Musical Blacksmiths is an amusing piece where a group of metalsmiths sing and tell jokes before having lunch. The Five Bachelors is a comedy short about a group that needs to initiate a new member into their ranks, and The Old Guard is a drama about an old soldier who served under Napoleon who is near death. One of my favorites was The Deaf Mute, a Civil War drama that was shot outside (the only film in this collection that has an exterior shot). 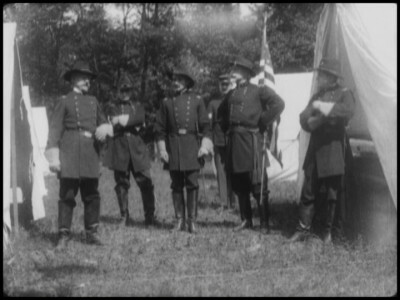 A group of Union soldiers think that there is a spy in their midst. When they capture someone creeping around their camp, they're sure he's the spy even though he proclaims to be a deaf mute. This film runs as long as the other ones (about 6 minutes) but it seems to end without resolving the plot, which makes me wonder if there was a second reel originally. The Library of Congress restored the audio to these films but… there's only so much one can do. These were mechanically recorded on wax cylinders. In other words an actor would shout into an off-screen horn which was connected to a needle. The sound waves would vibrate the needle and that would cut grooves in a wax cylinder. Needless to say this very analog technique did not produce a high fidelity recording. To increase the volume of the audio so that it could be played to a room full of people this original recording was "amplified." They connected it to a machine that would read the original and cut larger grooves into a bigger wax cylinder. As anyone who has ever made a copy of a cassette tape knows, this decreased the sound quality and added more noise. The result on this disc doubtlessly sounds better than it would have in 1913 if you were in the audience of a Kinetoscope show, but it does show the limitations of the technology of the time. There's a lot of extraneous noise and the voices are not crisp and clear. About what you'd expect from 1913 technology. The video quality on these rare films varies. Some are crisp and clean, while others are marred with dirt and scratches. All of them are very watchable and, since they are often taken from the only existing print, the best you can expect. There are two nice extras on this disc. 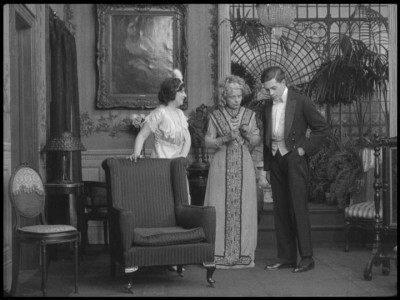 The first is a Kinetoscope film where the audio cylinder has not been found. Ben Model accompanies the short on piano. The other bonus is a 25-minute history of Kinetoscope films presented by George Willeman from the Library of Congress. He talks about how the films were produced, the problems associated with their exhibition, and he also discusses how they were restored and finally paired up again. It's a very nice documentary about the Kinetoscope and the restoration project. These are rare historic films and it is amazing that they are available on home video. While the movies themselves may not be as entertaining now as they were over 100 years ago, they are a fun document on what was thrilling to our great, great grandparents. People who are interested in the earliest days of film should make a point of searching this out. It gets a strong recommendation.